Next up portal keeper Hasabel which didn't seem that frightening given its few changes over the normal difficulty mechanics. Sure more laser lanes to dodge and imps require interrupting now but that will be fine... right. In comes the imp spawn...1....2....3....4....5.woooh.6.7..woooaahhh..8...too..many...9 and we wipe. So yes those imps posed a major problem in our raid size as the number of course doesn't scale with raid size. Having only 4 dps on the main platform dealing with imps we struggled massively especially since we lack any way to group the imps up meaning our aoe stun/disorient spells don't hit that many imps either. After having reassigned dps we now had more of them on the main platform and while we made progress it did feel more like being lucky than being in control of the fight in terms of dealing with imps. 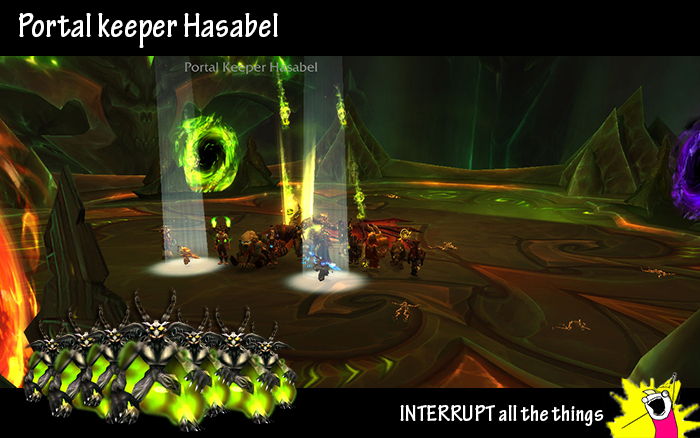 We manage to kill her but not before she took out all of our ranged 2 poor hunters and a warlock. I'd like to see a change where there are less imps but higher hp as then it would actually revolve around interrupting properly as opposed to too many imps with very little health. I feel like these adds simply miss the mark to accommodate for smaller raid sizes with less diverse classes.